Jennifer Kronenberg and Carlos Guerra are used to being the center of the action from their years as leading dancers at Miami City Ballet. But managing the whirl of activity at a rehearsal of their fledgling troupe, Dimensions Dance Theatre of Miami, is a whole other dizzying dimension—coaching ballets, fielding questions from a photographer and a dancer managing company logistics, squeezing in a quick self-coached rehearsal for themselves. Kronenberg perches on a bench as a costume designer hems her skirt, talking through schedules with Guerra before they hurl themselves into Ronald Savkovic's fraught Transparente, releasing real life tensions in choreographic drama. Ballet dancers are nothing if not enterprising, and Rebecca King is certainly one of the most ambitious. The Miami City Ballet corps member has long been something of a social media maven—she helped coordinate an Instagram campaign for MCB and even started her own social media management company. She's also contributed regularly to her popular blog, Tendus Under a Palm Tree, since 2010. This week, King and fellow MCB corps member Michael Sean Breeden have started a new media venture: podcasting. Their self-produced show, “Conversations on Dance" (available on King's blog and on iTunes), will include discussions on training, technique and choreography, as well as interviews with other professional dancers. This week's timely topic: summer intensives. King and Breeden join an increasing number of dancers taking to the virtual airwaves, including MCB soloist Lauren Fadeley, whose show, “ReDiscovering the Dream," chronicles her recent career move and new life in Miami. 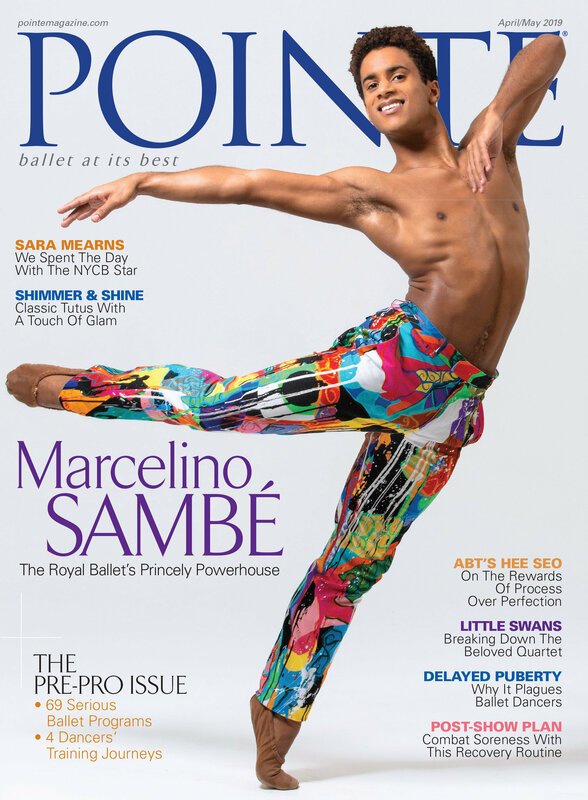 American Ballet Theatre principal James Whiteside, New York City Ballet principal Megan Fairchild and advice guru Kathryn Morgan have also started hosting their own podcasts on Premier Dance Network. So get your headphones ready. Dancers on dancing? Yes, please! King in Raymonda Variations. Photo by Daniel Azoulay, Courtesy MCB. On a flight home from a teaching stint in California last summer, Miami City Ballet corps member Rebecca King wrote a letter to her former self to post on her popular dance blog, Tendus Under a Palm Tree. Her hindsight advice to aspiring ballet students—no chit-chatting in class, implement corrections, study ballet videos—ended up going viral, eventually landing a page in Florida's World of Dance Magazine. “Sometimes what takes off is a surprise," says King, 27, a native of Northern California who founded her blog in 2010. “It's made me realize how important social media can be for all businesses, especially in the way it can affect art."